We went to Kmart today hunting for Shoes for Lilly-Rose....this was a wild goose chase for a pair of shoes with a certain character on them. Three stores later we still did not find them! While there we decided to look at strollers and car seats for Emma-Kay. Lilly's old car seat is expired and her stroller got wet. So here we are needing a stroller and car seat again. We both would love a combo set...where the seat latches into the stroller. So I was looking and came across the above stroller. Now I guess b/c it was pink...I feel instantly in love with it. It has the cutest little floral design on it. I seen next to it the matching car seat for 42.00. I look down to see how much the stroller was...14.00!!!!! That's right this combo can be yours for 56.00!! 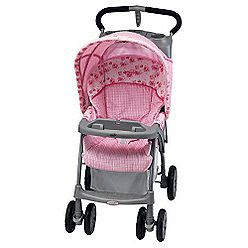 They are over 100.00 at walmart for similar looking strollers and car seats. We found they had none in the back, refused to sell us the displays, and there was none at our second location. When I got home I looked online and they are sold out there as well. So if you have a local Kmart you might be able to pick one of these up for only 14.00 and it's made by evenflo. I had an Evenflo stroller for Doots I bought second hand for 10.00 at a thrift store. That stroller was awesome and lasted us until we accidentally left it in the rain last year. We could not get the smell out. We placed it on our back porch not knowing we had a leak.